Apple on Saturday uploaded the first TV-length ad for the iPhone XS and XS Max to YouTube, dubbed "Illusion." The ad was first seen during Apple's Sept. 12 press event, and features gold versions of the phones against a stark black background with a magic theme. It doesn't delve into any depth about the phones' features however, except to highlight the size of their OLED displays with the slogan "Welcome to the big screens." While the iPhone XS is the same size as its predecessor, the 5.8-inch iPhone X, the XS Max is Apple's biggest phone ever at 6.5 inches. That's 0.1 inches larger than the Samsung Galaxy Note 9, and 1.4 inches off the size of the iPad mini 4. The XS is in most respects faster version of the iPhone X, but does have other upgrades like dual-SIM support and significantly improved photography, including better low-light performance and processing enhanced by the A12 processor's upgraded Neural Engine. Owners can even adjust bokeh after a photo was taken. 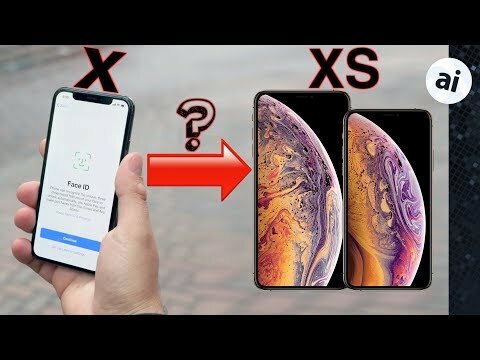 The XS Max is essentially the same device, simply with an enlarged screen. Preorders for both phones are underway ahead of a Sept. 21 launch. Gizmodo is excoriating Apple for "hiding" the notch in this commercial, claiming it's all but unethical. Ever notice how these douchebag websites latch onto something negative and beat it to death? First the headphone jack and now the notch, both of which have been proven to be accepted by the majority of buyers. When's the next Samsung notch shaming ad coming coming? Anybody? The soap bubble wallpaper does hide the notch but might not be on purpose because the XR wallpaper does not hide it. Apple has some interesting fetishes. As do their customers, who continually reaffirm and vote with their wallets. I haven’t taken the time to run the numbers but I imagine the note has as much screen area despite the smaller screen size. I prefer the notes “non-notch” style. That said, it’s alright. As my iPhone keeps expanding its role as my de facto primary digital device the larger screen of the XSMax should be an interesting shift from my iPhone X.
I like this ad. Interesting. Why didn't anyone throw a fit when the Galaxy spy machine hid the forehead and chin in every ad with their wannabe Apple wallpapers?? You do know the notch is where the camera, sensors, FaceID, speaker are located right? Apple didn't "choose" to put the notch in, c'mon use your head. "Samsung's Note 8/9 is not only aesthetically better but does not rob the user ANY video real estate." Sigh..... obvious alterior motive aside, you fell for their ads didn't you? The iKnockoff Galaxy series has both a chin and forehead, robbing you of "video real estate". Your bias and ignorance makes you no different than the paid media morons. Apple didn't "choose" to put the notch in, c'mon use you’re head. If you turn the brightness up, you can clearly see the bezels in Samsung’s pics. In Apple’s pics, there is *zero* color difference between the notch black and the screen black. The notch might be difficult to see with a black screen, but it’s not invisible. This “invisible notch” is obviously not a representation of reality, and it was a deliberate choice by Apple to misrepresent the phone’s face. I’m not saying that they’re actively trying to *mislead* buyers, but they’re definitely downplaying the notch. As they should. Because it’s embarrassing. It will also be interesting to see what the margin is between that soap bubble and the notch. How much of a gap did they leave? I am guessing zero, so they could maximize the illusion (apt name for the commercial) that the notch is unobtrusive. And of course Apple chose to put the notch in in the first place. They could have embedded the sensors in a thin bezel across the top instead of a thicker notch that literally carved out part of the display. I am with Rrrize — I have bought iPhones since day one, but I’m not buying another unless and until the notch is gone and FaceID with it. They’re both poop. So much bull in one post. "If you turn the brightness up, you can clearly see the bezels in Samsung’s pics." Ah it's the consumers fault for not turning up the brightness to the highest setting. Even after doing so you cannot see the chin and can barely(with some imagination) make out the forehead. But let's criticize Apple instead right? "This “invisible notch” is obviously not a representation of reality, and it was a deliberate choice by Apple to misrepresent the phone’s face." Apple never did it before. It's just a nice wallpaper get over it. Apple didn't do it with X either. "They could have embedded the sensors in a thin bezel across the top instead of a thicker notch that literally carved out part of the display. " So you guys complain that the notch takes up screen space and then suggest a forehead that takes up more space? I'm not stupid and most on this site aren't either, you obviously have an agenda against Apple so you twist logic to the point where Apple cannot win and then praise the most successful knockoff based on DIFFERENT logic (completely ignoring the top and bottom bezels on their "bezel-less iKnockofff). "I have bought iPhones since day one"
"but I’m not buying another unless and until the notch is gone and FaceID with it." Ah so you bought every iPhone with bezels, forehead and chin but suddenly that tiny notch bothers you and is "obtrusive"? Does anyone complain about the screen real estate that is lost due when viewing due to the ridiculous curved screen on Galaxy phones? Do Samsung measure their screen size including the curved edges or when viewed from above? It's clearly visible when the light hits it right. Why would they choose to put an obstruction INSIDE the screen limiting some of your video viewing content? They didn't put the notch inside the screen, they extended the screen up on both sides of the notch. Do these complainers realize that without the notch, the data signal, time, wifi signal, location pointer and other icons would move down into the screen? Obstructing even more screen real estate? When I first saw the notch, the location of these items seemed genius and it all clicked. Very clean and Apple. My question is why does samsung always come up in Apple conversation? Oh that's right, because it's the only piece of hope from the hundreds of knockoffs. How times have changed. Remember when this forum’s members were saying that Apple would never build a phablet? Well… times have changed… Today the smallest phone is hidden inside a stylish (Apple) watch; and we use our "phones" mostly to consume media, or to interact with something. That's both given us the option to have a tiny phone, and the need/desire for bigger screens. This “invisible notch” is obviously not a representation of reality, and it was a deliberate choice by Apple to misrepresent the phone’s face. LOL...it's not a misrepresentation of anything. There IS screen space to the left and right of the notch, the notch itself is black, AND one of the selling points for OLED is the deep blacks in combination with color. When you go to Apple's web site, the first image of the XS does include visual elements from the notch in combination with the exact same image displayed on the phone. Either you have a notch or you have an extended bezel to fit the camera and sensors (and one at the bottom for symmetry). There’s no way around it... not yet, at least. I'll be upgrading from the iPhone X to the iPhone XS. I like the size. I started Apple's upgrade offer with the iPhone 6 Plus, continued with the 7 Plus. I found the Plus sizes too large to handle comfortably. I've been using iPads since they came out, including the iPadPro 13" so I have no need for phablets. The iPhone 5s was too small, the Pluses too large but found the iPhone X just right. So I'm sticking with that size when my year is up on the iPhone X upgrade program.